Woolwich is full of surprises. Today I was sauntering down Woolwich New Road when something caught my eye. Something old, something new, something borrowed. Something called Blue Nile. 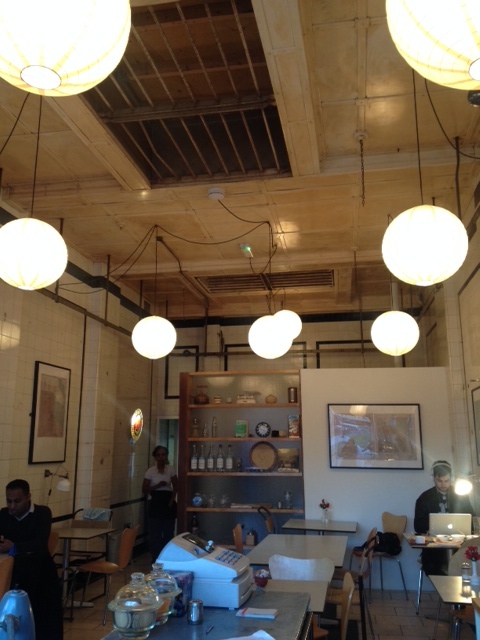 In short, an enticing café looking for all the world like it had gotten itself lost on its way to Shoreditch. A new café is headline material in these parts. Woolwich’s Twitter (and no doubt wider) community is anxiously awaiting some promised pubs and another café is due to open soon. We’ve been encouraging businesses to set up here with a vehemence that has at times bordered on bare-faced begging. Guilty as charged. Blue Nile, however, has materialised without any fanfare at all. Without us asking or waiting or pestering. How? Who? Where? What?! In a way, it has been there since 1935. Back then, a sausage-maker called William Geller built a shop. A handsome establishment it was, too. Its walls were clad with shiny white tiles set off by a smart glossy black trim, and its lofty ceiling provided plenty of space for meat hooks. This rare interior, with all its dints and scrapes and sundry marks of time, had remained hidden for decades, behind the false walls and false (much lower) ceiling of a café called The Salad Bowl. It wasn’t until owner Shewa decided to switch her focus from fairly standard British fare to a menu that embraces her Eritrean-Italian heritage that the old butcher’s shop was allowed to emerge from its erstwhile cocoon. Blue Nile’s interior preserves the original 1935 butcher’s shop walls and ceiling. Shewa’s son Jon and his wife Nina are architects and have designed the café’s interior. They have carefully preserved the original surfaces while deftly adding contemporary fittings and subdued lighting. Jon’s own excellent photos, and a poster he designed to commemorate the Tour of Eritrea, are carefully positioned around the café so as not to obscure too much of the tiling. And the food? It’s hearty, fragrant, earthy, communal, and easy to share and enjoy. The menu invites you to switch from Eritrean to Italian and back again, offering a daily soup, pasta, or rice special alongside more exotic (to me at least) kilwa and zigni (delicious Eritrean stews) served with injera bread. Shewa and her other son Daniel, who works front of house, will gladly talk you through the menu. If, like me, you know diddly squat about Eritrean cuisine, the Bebiaynetu set menu is a great place to start. You get five meat or vegetable stews and as much injera bread as you need to mop it all up. We also ordered a side of yogurt, which worked well with the spicier dishes. For dessert, you can dip your spoon into affogato (espresso poured over icecream) or tiramisu, or try some himbasha, a sweet cardamom bread freshly made on premises. Then, you can linger over coffee and baklava, or cleanse your palate with some Eritrean kemen tea, which is infused with cloves, cinnamon, ginger, and star anise. The Eritrean-Italian connection is steeped in history. The Italians invaded Eritrea in the late 19th century and Italian Eritrea was formed in 1890 as a colony of the Kingdom of Italy. It stayed that way until 1941 when the British took control (until 1952, when Ethiopia annexed it). About one in six people in the capital, Asmara, are descended from the Italian-Eritrean community, and Asmara is well known for its colonial and modernist Italian architecture, as well as piazzas and cafes. It takes about 10 or so hours to fly to Asmara. I will get there one day, but meanwhile I’m going to enjoy settling in to our own piece of Italian Eritrea, right here in Woolwich. Details: Blue Nile is at 73 Woolwich New Road, Woolwich, and serves lunch and dinner. For menus, prices, and opening times see www.bluenilecafe.co.uk You can also follow Blue Nile on Twitter @bluenile73 or find them on the book of faces. I wish someone would set up an old-fashioned Pie and Mash shop in Woolwich! Excellent. Looking forward to a visit. Menu is enticing! I think its a great addition , have now eaten there twice, both Eritrean and Italian food and both times really tasty and great value. The interior is beautiful and the cafe has a lovely relaxed vibe as you watch Woolwich go about its business in the square outside. Amazing to consider that , the little stretch of road there also has Kailash Momo, and An ( Vietnamese).Truly cosmopolitan. I had a lovely lunch there Friday. Very helpful waitress and cook (owner?) with my first introduction to delicious Eritrean meat and veg and pancake (name escapes me) along with delicious mango smoothy. yum. I’ll be back!